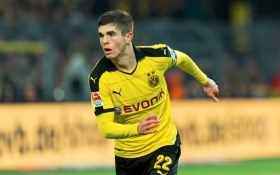 Chelsea are understood to have beaten the likes of Manchester United and Liverpool to the future signing of Christian Pulisic from Borussia Dortmund. The USA international has already snubbed a new deal with the Bundesliga high-flyers and reports have indicated that the club may seek to cash in on his services as he enters the final year of his contract next summer. As such, the likes of United, Liverpool and Chelsea have been sporadically linked with the highly-rated attacker but according to The Mail, the latter are understood to have sealed a verbal agreement. The Blues are understood to have already held preliminary talks with the German giants and reports indicate that a deal worth £60m is set to be finalised next year. Blues boss Maurizio Sarri is understood to be keen on bolstering the attack front with both Willian and Pedro on the wrong side of their 30s while the future of Eden Hazard remains uncertain beyond the current season.